When C was a newborn, I made a knitted blanket out of yarn from my stash. 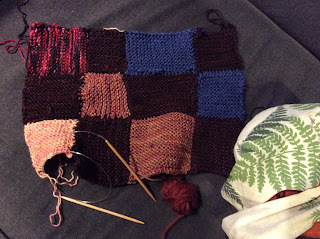 This week I started knitting another scrap blanket, this time out of the smaller leftover bits I seem to have tucked into many drawers and corners of my home. We are going to do a month of decluttering, purging, and selling off unused belongings in March (stay tuned!) but we aren't going to save things just to get rid of them later. We've slowly begun selling things and getting ready to let more go. In this case, I'm combining scraps and loose ends (get it? hah!) to make a grander whole. I started another batch of sauerkraut to make using the Fermenter Kit that the lovely folks at EcoJarz sent for me to test and review. Stay tuned for this week's Satur-DIY post where I (finally!) review and walk you through making your own sauerkraut!